Probably like many of you, I don’t have nearly as much time to tie flies as I’d like. But when I can sneak in those precious few minutes to lash some feathers and fur to a hook, I like it to be organized so I can maximize my time–whether it’s preparation of materials or getting the necessary tools laid out ahead of time. Cool factor aside, the small pottery just wasn’t a very practical fly tying tool holder. Every time I reached for one tool, two or three others inevitably got snagged and came along for the ride. Whip finishers, hackle pliers, and scissors don’t really play well together in a crowded space like that. I needed something that would spread out my tools, giving them breathing room for easy identification and access. 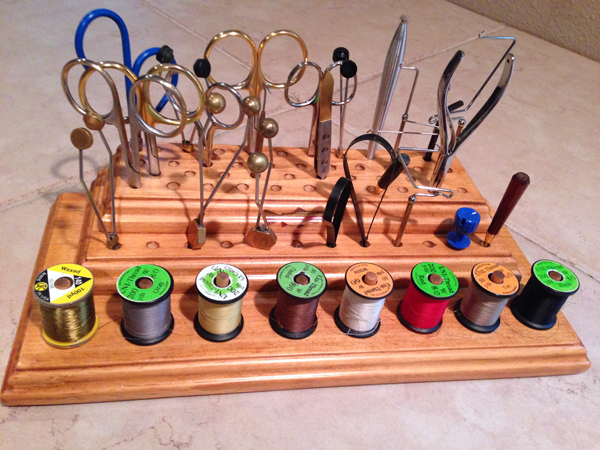 A quick eBay search lead me to the Middle Stream Tool Caddy from Little Village Fly Tying. 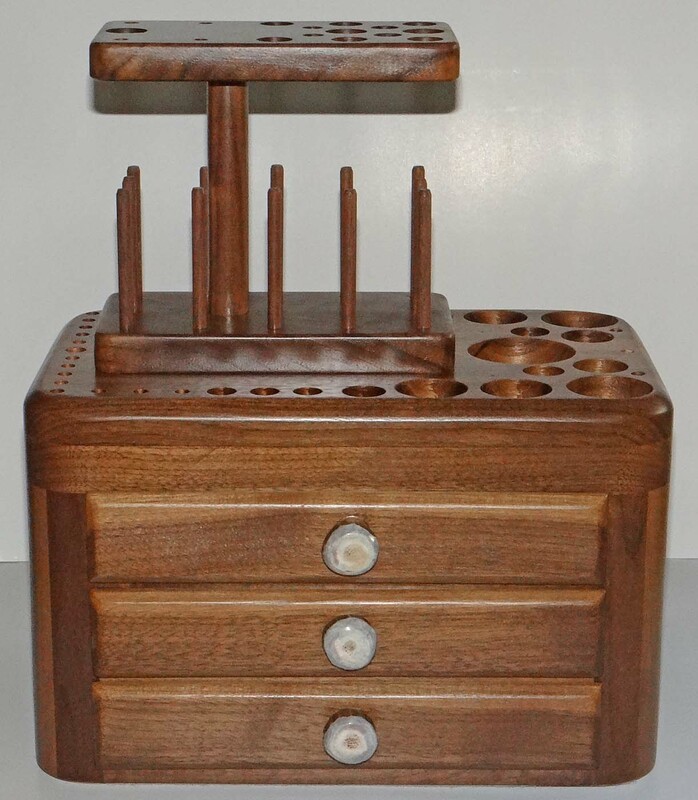 It’s an attractive, classic looking tool organizer that holds 56 tools and 8 spools of thread. What appealed to me most was that instead of having all my tools in a tangled mess, I could spread them out in a way where I could easily see and access them without hinderance. I don’t have 56 tools, so the extra holes give me a lot of flexibility in terms of organization. A welcome change. At 12″ long and 5.5″ wide, it takes up minimal space on my fly tying desk yet has the capacity to hold more than I’ll ever need so it’s scalable (another bonus). I store all my threads in sewing racks but since this caddy has spindles for 8, I decided to load it up with my most-used threads just to make it a little more convenient. 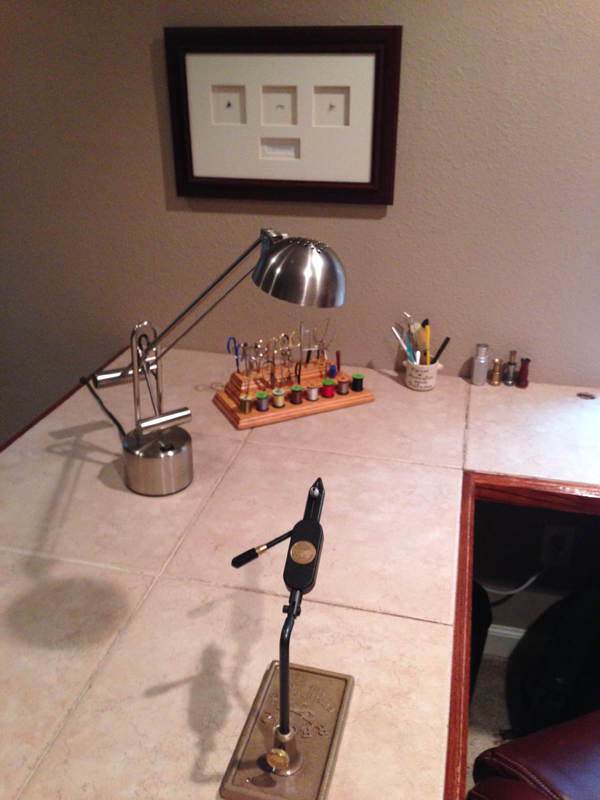 Now, when I walk into my fly tying room, I’m as confident as a surgeon who knows that all the right tools will be laid out properly before an operation. If you’re looking for desktop organization with some character, check out Little Village Fly Tying. Tip: I’d search them on eBay first because they sometimes offer their products at a discount there. How do you organize your fly tying tools? neat-o. i think i will pick one up. Are you moving forward or backward ? For me, organization is a step forward. Thats a handy looking setup Jason. I’ve got something similar but not quite as nice. Mine is made of plastic, but it was a gift, so I use it proudly and find it very practical and useful. One thing I don’t see in your tools is a pair of rotary hackle pliers. Have you not discovered the beauty of this tool for tying a sakasa? I can’t see myself not using it, so much control, so easy. JD, yes I have a pair of rotary hackle pliers. They do work great but mine don’t grip the feather very firmly. There are two rubber o-rings on the tips that are supposed to improve the grip but they end up having the opposite effect so I stopped using them. Which kind do you use ? I use the Griffin rotary pliers. They have the O-ring on only one of the jaws. Not sure if that does make much of a difference or not, but they do hold well. Sometimes they’ll slip but not often. I also use the teardrop style similar to the ones you have pictured above. 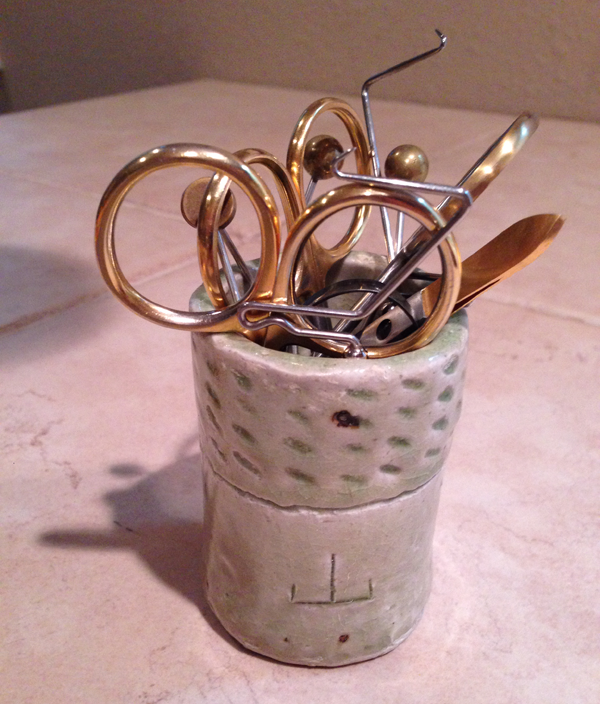 Here is a Fly Tying Tool Caddy that adds portability and a compact size. It is suitable for use in all environments from classy fine dinning table to a flat rock by the stream. Use it as a stand alone or with your basement fly tying studio. I have been making these for about three years and have sales world wide. See the website for current caddies for sale. Hi John, the link you posted doesn’t work. Can you please repost it? that looks great where can you buy them,?